The 1st January 2017 marks 15 years since the Euro was introduced as the primary currency of the European Union (EU). Initially, it was adopted by 12 EU countries including France, Germany, Italy and the Netherlands. Our analysis looks at how the change in the EUR/GBP exchange rate over that time has provided opportunities for British and Eurozone property buyers to benefit from currency movements in the other’s market. Despite its short but eventful history, these opportunities have been plentiful. 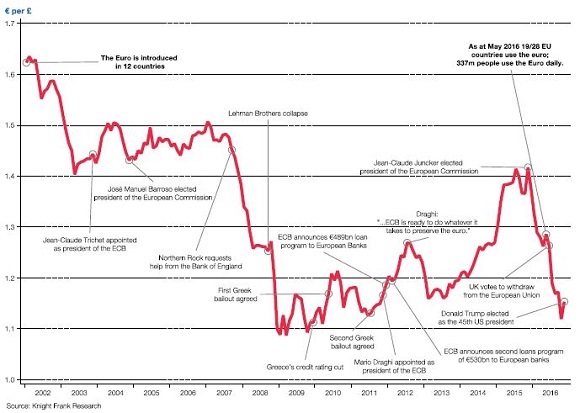 The chart below shows some of the keys events which have moved the EUR/GBP rate. For example, a Sterling-denominated buyer purchasing property in the Euro-Area in January 2002 (€1.62/GBP) and then selling when the Euro was at its highest since its inception against the Pound at €1.09/GBP would have seen a 49% gain on a currency basis alone. Conversely, a Euro denominated buyer who purchased property in the UK in March 2009 (€1.09/GBP) and then sold when the Pound was at its post financial crisis high against the Euro at €1.41/GBP would have seen a 30% gain on a currency basis alone. Find the latest global research via Knight Frank's research portal.